SEGA finally pulled back on its new Sonic game this week. 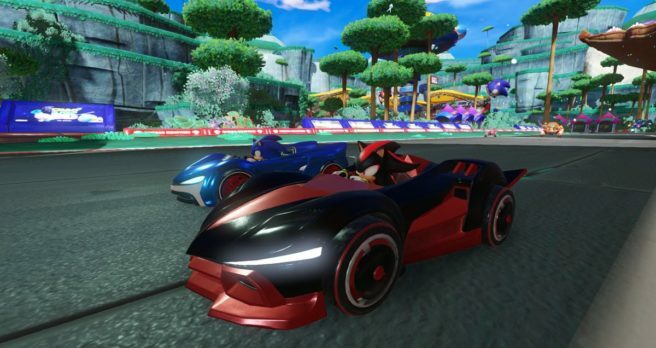 In Winter 2018, Team Sonic Racing will arrive on Switch. During an official live stream, Aaron Webber from SEGA’s social media and PR team commented on the game a bit further. He confirmed that it will be playable at E3, and footage is coming soon. Webber also said that the project has been in the works for a while. Webber stands by what he said earlier in the year in the sense that Team Sonic Racing isn’t a sequel to Sonic & All-Stars Racing Transformed. It will be “very, very different” and will have “very interesting mechanics”. In terms of characters, there will be more Sonic characters in Team Sonic Racing than in any of the past racing titles done with Sumo Digital. Webber teased, “Maybe there are some characters you have yet to see and play as that you haven’t been able to play as in a long time.” There will also be voiced lines in the game. Lastly, Webber brought up how Sonic is racing in a car. This is something he has been continually asked about, starting with Sonic & SEGA All-Stars Racing back in 2010.